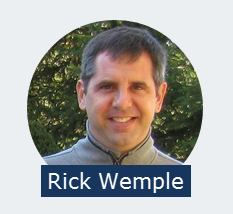 Rick Wemple is a personal trainer and motivational speaker who lives in Chicago, IL. A Dayton, Ohio native, Wemple spent 15 years in the Northeast for college at Yale University and coached Cross Country and Track & Field at Yale and Brown University. Rick earned a Bachelor of Science in Biology from Yale and a Master's in Exercise Science from Ohio State University and is a certified personal trainer through the National Academy of Sports Medicine. Rick has been speaking about Finding Your Treasure Within and how the messages we give ourselves significantly influence our thoughts and feelings, and ultimately, our decisions and actions.